Kung Hee Fat Choi or Happy Chinese New Year! Since the date this year falls on a Thursday, most of the festivities were over the weekend. We went to Chinatown last Friday and Saturday and saw various lions, dragons, and other events. On Saturday, after the big parade, we went over to my auntie's for a ton of food. Most was ordered but I did make my duck recipe shown here. Unfortunately, I failed to take pictures until we'd almost devoured it completely. Oh well, maybe next time. I've used this recipe for years and unfortunately no longer remember where I found it online. Trim excess fat from the neck and body. Rinse the duck, inside and out, and pat dry thoroughly with paper towels. Combine the Chinese five-spice, sugar, and salt in a small bowl. Rub the spice mixture all over the duck, inside and out. Stuff the duck cavity with the ginger, garlic, green onions, and peel. Fold the wing tips back under the duck and tie the legs together with kitchen string. Poke the duck breast a few times, piercing the skin. Place a roasting pan on the stovetop over 2 burners and fill with 2-inches of water, turn the heat to medium. Set a V-rack insert inside the pan and lay the duck on the rack, breast-side up. Cover tightly with aluminum foil. Steam the duck for 45 minutes, checking the water level periodically. In a small saucepan combine the vinegar, honey, and soy sauce over low heat. Cook and stir for 5 minutes until thick. Take the foil off the duck, remove the rack with the duck, and pour out the water and all the fat that has rendered out (this is great to use in other dishes like fried rice.) Put the rack with the duck back inside the roasting pan. 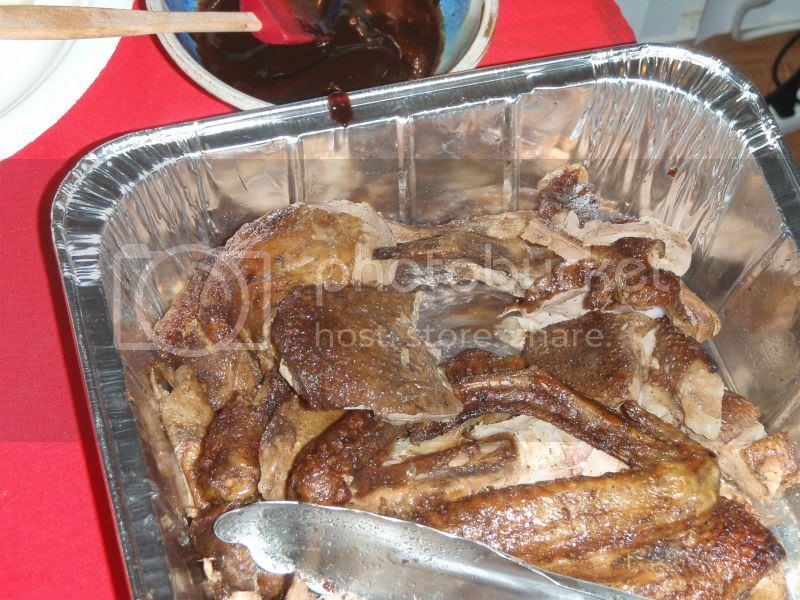 Baste the duck with the vinegar mixture, until all the skin is completely coated in the glaze. Roast the duck for 1 hour, basting periodically with any remaining glaze to set in a deep mahogany color. Tent the breast with some foil if it gets too dark. The legs will wiggle easily when it's done. Carve and serve with hoisin sauce and steamed buns or wraps, if desired.